Transforming lives by challenging perceived limits and conquering them. The Nepal Project is an IRS registered 501©3. It is focused on building schools and developing educational systems in the Dang Valley of Nepal. We work with local leaders to discover and address problems with educational facilities and teaching resources. We operate independent of any government or non-government organization and are not affiliated with any non-profit organization in the USA. The vision of the Nepal Project (TNP) began when the Peace Corps assigned Jeff Gaura to His Majesty’s Kingdom of Nepal, ruled and governed as a monarchy. After completing basic language and cultural training, he lived and worked in the Dang Valley of Western Nepal between 1987 and 1989, trying to make a difference in the lives of the people he met. His time in Nepal changed his world view. The lack of electricity or indoor plumbing appeared to create a much simpler and therefore joyous life. People woke up at sunrise and were all in their homes at sunset. Food was always fresh and seasonal, and nearly everything needed that couldn’t be manufactured at home was available at a market that was only a 90 minute walk away. Right now, and 6 hours from now were the same word, and anxiety played nearly no role in their society. Soon, the flaws of that perceived happiness were exposed. He saw peaceful people suffer from illnesses that could have been avoided. Malaria, Tuberculosis or multiple forms of dysentery hit nearly every family, and none of the local villagers could offer a correct explanation. They failed to propose and execute any solutions for preventing future instances of these diseases. Second, women cooked on wood stoves in a unventilated kitchen inside of small mud homes. These stoves lacked chimneys, and the chronic exposure to the smoke caused eye ailments and diseases. There were no pit toilets nor was it viewed as socially inappropriate to contaminate drinking water. The only crops and food that people grew came from mimicking what their parents taught them and grew. As a result, there were many months each year the harvest offered no green vegetables nor any protein to eat. The population would physically slow down, as they lacked the nutrition to keep moving. There were more stories to share, but after repeated conversations with local leaders, both men and women, the missing link became obvious. Nepali people were and are intelligent, but they were not educated. The culture held teachers in high esteem, but the government could not build schools to keep pace with population growth. Local district education funds were not enough to pay teachers a complete salary, and most teachers were required to do other jobs to supplement their income. He knew that every listed problem could be readily tackled, but only if the people could read, write and do basic math. Thus formed the first semblance of TNP. Jeff shared his vision that education could address these issues with a long term solution, and it would give the community a place to come together where Jeff could instruct them in basic preventative health care, chimney construction, pit latrine construction and vegetable gardening. The first job was to rebuild Saudiyar School, the existing school that served that area of Dang in which he lived and served. Saudiyar was damaged by a wind storm during Jeff’ 2nd year, and the school lacked the funds to address the problem. Instead, elementary school children would sit either in the exposed sun or under a tree and listen to their teachers present subject matter. Students retained nearly nothing they heard, due to the extreme heat of the Ganges River basin. Jeff found some donors to contribute $2700. With this money, a new building that supported all students from 3rd through 7th grade were accommodated. A picture of that school is below. In addition, TNP helped a local Tharu man learn how to make concrete roofing tiles to reflect the south Asian sun instead of absorbing it like the tin roofs of the past. The school took 4 months to build. Locals donated mango trees that we used to fire the mud to make bricks. Farmers donated their mules to carry 50kg sacks of concrete from the local bazaar to the school, where they were converted into roofing tiles. Many people helped form bricks from mud and straw and even more helped clear the land where the new school was built. Farmers donated food and produce during the work, to keep the volunteers full of food and happy to help. A school for 1200 had at least as many volunteers helping with the construction. It was the talk of the town. And, it was all done without the use of electricity or running water, at any time. During the months that followed the completion of the school, Jeff was busy with educational instruction projects. He traveled from school to school, instructing local teachers about American pedagogy, and he demonstrated for them, in their classroom, how to engage students and make education lively. Back at the new school, he gathered all the local women who would come and taught them how to make a smokeless stove. This required introducing chimney based stoves, and he was fascinated to learn that there was no word in their language or ancient Sanskrit for “chimney.” He took some broccoli seeds that his father sent him to local farmers whom he knew and trusted, and he helped them plant them. 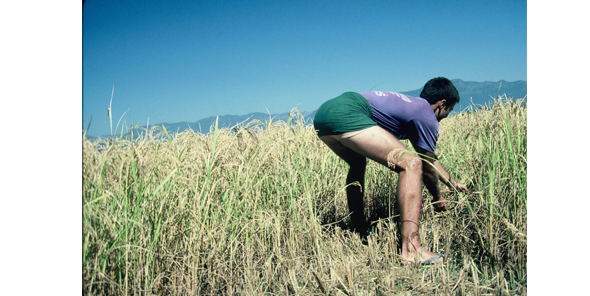 Before he left, he saw the first harvest of what the Tharu people called “Browcowli.” He helped a few villagers build pit latrines and as his two years came to an end, he caught a flight on a small plane that passed directly over his village as it took off. He could see from the air the school, the nursery, the gardens, and smoke rising from some of the homes that now had chimneys. He had made a difference. After returning the US from the Peace Corps, Jeff became a Christian. This also changed his world view. Jeff had always thought that he could do more to help. This moment added an additional question to TNP. How can we share the love of Jesus with the people of Nepal, as we help them build and staff their new schools? He decided that nothing needed to change in the current process-talk to local leaders, find out what it is that they are missing, and find a way to share the responsibility. Two big items were missing. #1: Prayer. He knew that he needed prayer support, and he wanted Nepali people to begin receiving prayer. He started a newsletter to facilitate this. However, the distractions of day to day life in the US prevented the newsletter from being consistent. He needed more tools. #2: The involvement of other Americans. He needed a board of directors to help him with tough decisions. He needed to allow others to participate, even if there was a language barrier. This was not the Jeff project, but the Nepal Project. Jeff shared his stories with his local church, and they supported him and the people of Nepal with both prayer and gave him a route for others to send financial support to. With their support, over the next few years, they were able to collect enough money to build a new elementary school as well as collect funds to add additions to the first school. Jeff was able to visit Nepal on two occasions to see these schools and meet with the new leaders and the new leaders of the past. Alas, financial impropriety showed its head, but not on the Nepal side of the effort, but in America! The leader at the church responsible for the money decided not to reimburse Jeff’s expenses, even though the money had been donated and approval for the reimbursement was in writing. Jeff saw that his donor’s money was being misused and being redirected to other things. Over several months, he repeatedly asked for reimbursement for money that he spent on TNP. The requests went unanswered but nearly everyone involved. It was time for a new home for the Nepal Project. As such, The Nepal Project, Inc. was established independent of any church and is a non-profit corporation. A board was created, with separate banking accounts, articles of incorporation and a Tax ID number. Donors began to send in assistance. Marty Cocking can do much of this, but others are needed. The nature of TNP is ongoing efforts, based on the needs in Dang. The government has stablized, and travel to Dang is easier now that the airport in the valley has reopened. Travel was nearly impossible for any Westerners for nearly a decade. Our plans all receive both Nepali and American input before they are formalized, and they are prayed over. Jeff will be going to back to Nepal every year to meet with the local village leaders again to see how the current schools are doing as well as visit the local college where Nav Raj works. He will bring more and new seeds to introduce to the community as well as teach a class on sustainable agriculture to a select group who he knows will listen. In the near term, TNP expects to bring Khopi Ram Chaudhary to the US for additional training in construction management. Purchase yak blankets. Each blanket is $35 and shipping is $9 for each 2 blankets. Purchase a Yak Blanket or make a donation. Amazon smile. Each time you buy on Amazon, you can have a portion of the purchase donated to The Nepal Project. Go to smile.amazon.com and select The Nepal Project as your charity of choice. Corporate matching funds. The Nepal Project is registered with yourcause.com allowing companies to match their employees' gifts. Join us on a future trip to the Himalaya.